Dr. Matt Allen was born in Mars Hill, North Carolina and is a graduate of the Appalachian College of Pharmacy. He attended East Tennessee State University for his undergraduate studies. He is licensed as a Pharmacist in the states of Tennessee and North Carolina. Matt has over twelve years’ experience in pharmacy practice, with special interest in independent pharmacy, retail sales, and clinical programs. He is a member of the Greene County Partnership chamber of commerce. 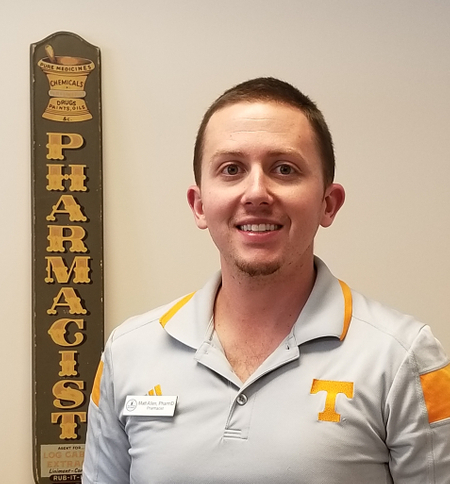 Matt is a member of the Tennessee Pharmacist Association and National Community Pharmacists Association. In his spare time, Matt enjoys traveling, trout fishing, golf, and spending time outdoors. He is very excited to become a cornerstone for healthcare in the growing community. Matt resides in Greeneville, TN with his wife and daughter. The technicians have over twenty years of combined pharmacy experience. Local people serve the community best, and all the staff are native residents of the communities we serve.